Lutterworth Town boss Josh Dixon believes the next month will show whether his side are genuine title contenders in United Counties League Division One. 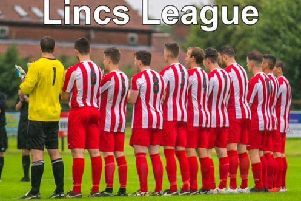 They embark on a challenging few weeks with matches against teams at the top, starting with leaders Melton Town on Saturday. After that their next three games are against Anstey Nomads (3rd), Blackstones (4th) and Harrowby (7th). Throw in a County Cup encounter with Premier Division side Oadby Town and it makes for an interesting month ahead. “It’s going to be a good gauge of where we are,” is Dixon’s assessment. “We’ve got a really tough October and I think the five of us are the teams who will end up fighting it out at the top. “Where we are at the end of October will certainly give us a good idea of where we will be in the season. “We could win them all and be well clear or we could lose them all and have to re-think. The Swifts are sitting in second place, three points behind Melton but with a game in hand. Their last four matches in Division One have seen them score 22 times while only conceding two in reply. But, despite their prolific form at the striking end of the pitch, it is their ability to keep them out at the other that has given Dixon most satisfaction. He explained: “We’ve been scoring lots of goals but we’ve always known what firepower we have. The fact we were top scorers in the division last season proved that. “What is probably more important is that we’ve been keeping lots of clean sheets. “We’re confident we’ll score so it is keeping them out that will help get us close to where we want to be. “We saw last year from Pinchbeck how important it is to have a strong defence. “We’ve been putting in more mature performances this season which is pleasing. One thing that has not gone Town’s way so far is their form in the knockout competitions. After some joy in the FA Cup, they have since bowed out of the FA Vase (2-1 at NKF Burbage) and the League Cup (2-1 at Kirby Muxloe). But Dixon insists that might be for the better in the long run. He added: “We went gung-ho for everything last season and in the end it caught up with us. “I was disappointed with going out of the FA Vase but you have to prioritise. “I made changes for the Kirby Muxloe game but still thought we had a side that could go through. However, it was not a priority. Elsewhere in Division One, Lutterworth Athletic had a difficult afternoon. 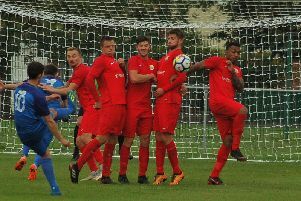 Before the match against Rushden & Higham they held a minute’s applause for their former player Tom Wiffen (see page six) who passed away last week. They went on to claim a draw from the game with Charlie Jones’ second-half effort earning them a point. They play Holwell Sports at home this weekend. In the Premier Division, Harborough Town were beaten to 2-1 at Wellingborough Whitworth giving their hosts a first win of the season.